Exploring a space in a different body can drastically change the way we perceive the world. This is a free pre-configured Wheelchair Controller for Unity3D. Earlier this year in his audio essay On “Walking Sims”, Dylan Schneider highlighted how the nature of exploring 3D physical spaces was not unlike an eye moving over a canvas. The essay talks about how our controllers for exploring these spaces are usually flawlessly able-bodied, neglecting a lot of unexamined ways to discover spaces in bodies different from our own, citing the example of a wheelchair. Here’s a demo that runs in modern browsers. To use the controller just drop the WheelchairController prefab into your scene. Being able-bodied myself, this isn’t designed to be an accurate simulation, but might be useful as a starting point in that respect. The default speed and size of the wheelchair controller is set from some researched averages I found. I’d love to hear your feedback, send me through an email or leave a comment here. Tested in 5.1.2p1 (but it probably works in 4 as well). 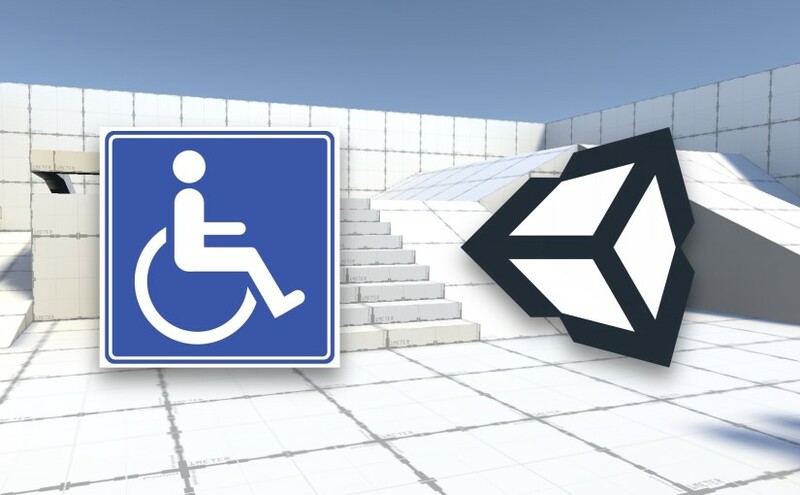 The Unity Wheelchair Controller is public domain and you’re free to use and modify it as you see fit (although you are a super nice person if you credit me in your work!). Hi Alex, I’m Paolo from Italy! i’m working on Unity3d and wheelchairs for my master’s thesis; your controller is very interesting but, can i suggest you one thing?… what about changing the angle of view in relation to the slope of the terrain? i think it will be even more realistic! Hey Paolo, that’s a really great and simple idea! I’ll be sure to implement it when I update the controller. My name is Abdulaziz and I am from Saudi Arabia i’m working on Unity3d and wheelchairs for my term paper. Can I use your script? Hi Abdulaziz, of course you may. Wishing you all the best with your term paper! This is really helpful. i am workinjg with architecture students on inclusive design and uysing VR to prototype. what is the texture package you use for your build here? Its very clear. Thanks Ben, the texture’s just the default Probuilder grid. Wishing you all the best with the course! just this for my final year project. I’m facing one difficulty though, my project is a VR enabled wheelchair simulator, and i need to simulate the environment using a joystick, so please can you guide me as to how I can do the it ? How can I download your demo? I loved!!! Hi alexandre, I was talking about the demo project xD, thanks for your awesome work!! do you have any tutorial on youtube?